Hello Loves! KBShimmer Bath and Body recently released their Winter 2015 Polish Collection. This collection consists of 14 new shades, including the 2015 Toys for Tots Charity color. This release also includes several winter themed water slide decals. I have some of those to show you but I'm waiting until a little later in the season. Be sure to check them out here. For today, I have seven of the new polishes to show you. Ready to see them? The first color I have to show you is one that excites me way too much. I have been craving a true red cream from KBShimmer for so long! Chilly Pepper is exactly that. The formula is perfection and the color is exactly what I dreamed it would be. Thanks, Christy! 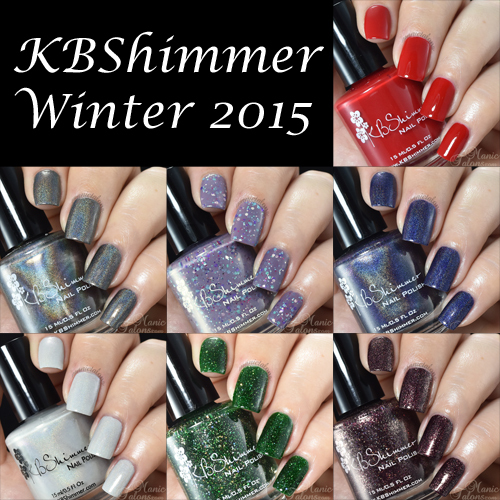 All of today's swatches use KBShimmer Clearly On Top topcoat as well. Excuse the bubbles in this one. It was the first one I swatched and I forgot to let the bubbles settle from shipping. I was a little excited. lol Clearly On Top is a quick dry top coat that does not disappoint! Next up is a strong, linear holographic polish with smokey, dark grey tones called Coal In One. Application is nice and I found it to be opaque in two coats. Brrr-tiful Dreamer is a grape leaning grey crelly with aqua, sliver, purple and fuchsia glitters. I found that this one needed three coats for even glitter distribution, but it was opaque in two. I should note that my camera didn't want to capture this one accurately. It is more muted than it appears in my photos. Claws and Effect is tied for my favorite polish in this release. It is a dark purple leaning navy holo polish with blue/pink shifting glass flakes. This polish has an incredible rainbow in direct lighting and the glass flecks really show off in indirect lighting. It has so much dimension and is opaque in two coats for me! Fleece Navidad is a soft grey/silver holographic polish with blue glass flakes. The holo in this one is subtle but beautiful. I swatched three coats here for full opacity. Kind of a Big Dill is a dark green jelly base with holographic glitters. I can't even begin to tell you how much I love this polish. It reminds me of a dark evergreen tree with those sparkly silver icicles. I swatched three coats for full coverage. Finally, Yule Worthy is described as a holiday glitter topper or stand alone polish. I don't like it as a topper, but I adore it in three coats as a stand alone! This is the perfect color to transition from fall to winter. It has a deep brown toned plum base and is loaded with holographic micro glitter. My photos didn't capture the holographic glitter effect, but I promise it pops in person and is incredible! *The polishes featured in this post were provided by KBShimmer for my honest review. This post uses Amazon Affiliate links. Purchases through these links generate commissions that help fund this site. All other links are courtesy links and do not benefit ManicTalons.com.